New listingDune Black Leather High Heels Size 39 / Size 6 - Excellent Condition, Worn Once! Dune high heel court shoes (size 6) and matching clutch bag. Plum Colour. These are a nice pair of shoes designed by DUNE. These shoes are a classic court shoes. 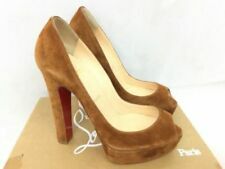 They have a nice peep toe with a great high thin heel. They also have a platform too. They are very simple and classic. 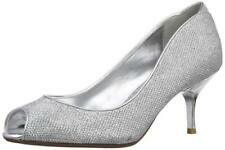 Grey T Bar Heels Size 3. Condition is Used (worn once as bridesmaids shoes, a few scuff and marks but nothing obvious or apparent, pictures of scuffs included in gallery). Bought from Dune in September 2018 for £55. Dispatched with Royal Mail 2nd Class. Low ankle strap with button detail. Dune White Mermaid-look Heels 4. Beautiful brand new heels by Dune. I bought these for an event but they are a little too high for me. These heels have never been worn as you can see by the photos. RRP £75. Any questions please get in touch. Please note: I do not accept international buyers Thanks! DUNETuape Suede/patent leather peep-toe platform with frill and silver detail. Beautiful shoe. The platform sole makes them glamorous but comfortable. Size UK 5 / EUR 38. 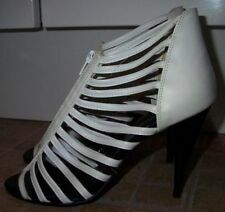 Dune Shoes Mackisha Size 3 High Heels 4" with Ankle Straps in Box . Dispatched with Royal Mail 2nd Class. Very smart blue faux suede stilettos from Dune (Head over Heels), with 3.5 ins heel, pointed toes and thin ankle strap. Model 172 Carris. Size UK 6 Eur 39. Hardly worn. dune gold sandals. Condition is Used. Comes with extra heel bottoms. Dispatched with Royal Mail 1st Class. Dune Skater SU-Plain peep court in champagne. Size 6. These shoes have been worn and do have some marks and scuffs on, see pictures. These shoes are coming from a pet and smoke free home. Please take a look at my other items. Dune Stiletto Shoes. Snakeskin Print. Condition is used, but only worn once, still in really great condition. Grab a bargain, listed with over a third off the RRP of £70. Closure: Buckle. Outer Material: Leather. Round toe style. With zip style at the back. Dune peep toe shoes with stiletto heel. Gorgeous shade of gold. There are 2 small beads missing on the side of one shoe, near the sole but they aren't noticeable and also slight chips on the heels, which shows in the photographs. The matching bag sold with them is unused and in perfect condition. The beads are really pretty. The heels have an unusual pattern near the top. You wouldn't be disappointed. From a clean, pet free, smoke free home. Please view my other items if you wish. Priced fairly at £15 for the shoes and £25 for the brand new bag. Thanks. DUNE GOLD SLIP ON SHOES/MULES WITH WOODEN STYLE HIGH 4" HEELS. LEATHER UPPER WITH CUT OUT SHAPED CIRCLES.